Reading contemporary histories of the First World War, I noticed that at the start the nation in the Balkans is referred to as Servia, but in numbers published after the back half of 1916, it has turned into Serbia. which seems to correspond to my observation. 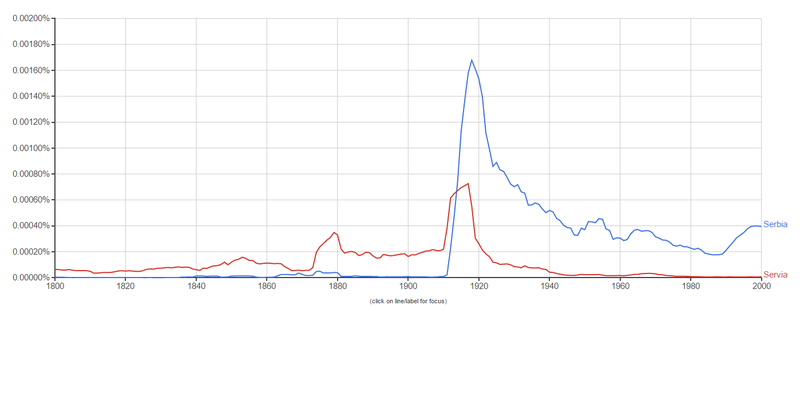 Edit Replaced Google NGram with version using capitalised names, as suggested by Steven Littman; the result makes rather more sense. In Ancient Greek, the letter Beta was pronounced like English B. But in Modern Greek, it's pronounced like English V. So "Serbia" became "Servia." It is called Serbia using the Cyrillic script and Servia when using the Latin script. Servia was the medieval Latin spelling of Serbia according to Etynomline. 1813, but in reference to the Wends; 1861 as "native of Serbia," from Serbian Srb, perhaps from a root meaning "man." Serbian is attested from 1848 as a noun, 1876 as an adjective. More common in 19c. was Servian. 754 (n.), 1723 (adj. ), from Medieval Latin Servia, from Serb Serb (see Serb). Servia suggested a false connection with Latin servus 'slave', reflected in English serf and servile (whereas serve and service have more positive denotations). Similarly, Rumânia was changed to România to reflect Romanian român 'Roman' rather than rumân 'peasant, serf', although too late to affect French Roumanie (English has mostly switched from Roumania to Romania). In both cases the desire was to avoid a name that sounded like "Serf-land". Not the answer you're looking for? Browse other questions tagged historical-change toponyms . When did 'venereal disease' become STI? When did saying “I'm offended” or “I find that offensive” become a common phrase in English? Why did English change so much between Chaucer and Shakespeare?